A martial art originating in Korea. It combines combat and self-defense techniques with sport and exercise. Taekwondo may be loosely translated as "the way of the foot and the hand." 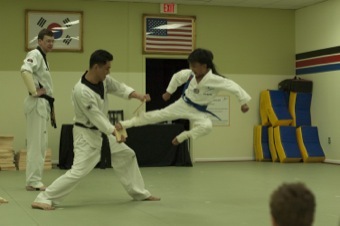 It is known for its emphasis on kicking techniques, which distinguishes it from martial arts such as karate or southern styles of kung fu. The rationale is that the leg is the longest and strongest weapon a martial artist has, and kicks thus have the greatest potential to execute powerful strikes without successful retaliation. Grandmaster Choi of US Royal Martial Arts is a 5th degree Tae Kwon Do Black Belt. Contains both long and close range fighting techniques, utilizing jumping kicks and percussive hand strikes at longer ranges and pressure point strikes, joint locks, or throws at closer fighting distances. Hapkido emphasizes circular motion, non-resisting movements, and control of the opponent. Practitioners seek to gain advantage through footwork and body positioning to incorporate the use of leverage, avoiding the use of strength against strength. Grandmaster Choi of US Royal Martial Arts is one of the few 6th degree Hap Ki Do Black Belts in the United States. Additionally, U.S Royal Martial Arts is designated as the American Headquarters of the World Hap Ki Do Federation. Abacus Mental Math is a unique fun filled holistic development program for children between 5-14yrs. Simply put, "number crunching" or arithmetic is a left brain activity and imagining those numbers in form of beads is the activity of the right brain. Therefore the triggers are sent to both the sides of the brain at the same time which helps to form more synapses between both the sides of the brain leading to whole brain development of a child.